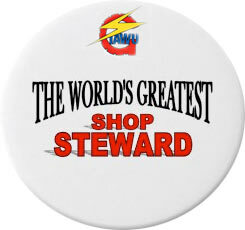 A Shop Steward (Steward) is an official within the organizational hierarchy of the Union Rank-and-file membership. The Steward holds this position voluntarily (through democratic election by fellow workers) while maintaining their role as an employee of the Company. As a result, Stewards becomes a significant link and conduit of information between the union leadership and rank-and-file workers. They are the first line of contact between Union, Management and Workers. The Shop Steward is the legal representative of the Union at the work place by virtue of the Labour Relations Act 15/1999, Section 25.2 (b). Discourage a worker(s) to be a member of a Union. Discriminates or take prejudicial action against a worker for lawful Union activities. Threatens a worker for participation in Union activities. Promises an employee benefits or advantage for not participating in Union activities. Stewards are automatic members of the Union’s General Council which is the 2nd highest decision making body of the Union. While carrying out the functions of a Shop Steward, the employer should not discipline, punish, penalize, deduct from his/her wages or in any way disadvantage the Stewards for approved time spent in the furtherance of any matter in the interest of a worker or workers in the Bargaining Unit. Are the eyes, ears and voice of the Union on the job and are expected to inform the Union of all developments on the job of an industrial nature, Monitor and enforce the provisions of the collective bargaining agreement (labour contract) to ensure both the company and union members are not violating the terms of the agreement. Monitor the workers and employers obedience to the Labour Code and Industrial Agreement and interpret both documents for the benefit of workers. Stewards raise with Management matters of grievance, clarity and concern on behalf of workers in or out of the presence of such workers. Represent and defend fellow workers whom the company believes violated company policy or the terms and conditions of the collective bargaining agreement, through the grievance process. The Steward is an automatic member of the Union’s Negotiating Team and it is the Union‘s policy not to meet with management for negotiations without a Steward being present. Communicate and disseminate official union policy, memos and directives to workers within the Bargaining Unit of the company. The Steward is also responsible for logistics at the workplace including but not limited to carrying out polls, distribution of printed matter, posting of notices from the Union and conveying information from workers to the Union. Popularize and promote union consciousness and values in the workplace by encouraging current and new employees to join the Union.